Things are melting, and it’s finally starting to feel warmer on our morning walks to daycare. Can I get a hallelujah? I don’t know about you, but I always feel better in the sun. My skin feels healthier, my energy is better, and overall I just feel a deeper sense of wellness. Do you feel that way too? This weekend, we took a day to soak up as much family time as we could. We made breakfast together, went for lots of walks outside, we grabbed a tea and perused the local shops (It’s the Breau boys’ tradition to go to Canadian Tire and stroll the aisles with the shopping cart shaped like a race car on Saturday mornings. I decided to tag along when I would usually utilize that time to get any work stuff I needed to do out of the way for the weekend. 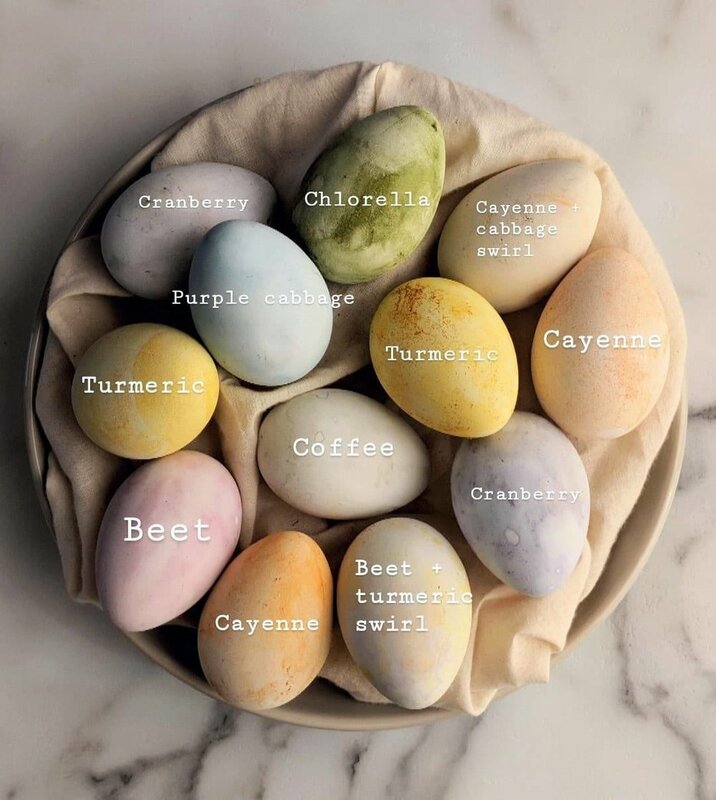 While we were out, I told Ryan that I’d love to try my hand at making my own natural easter egg dyes for Nate’s birthday in a few weeks. Then I realized something: If we did it THIS weekend instead, it would: 1) Give us something fun to do, 2) And it would give me the opportunity to share it here with you in time for YOUR Easter festivities! And so, after our morning of window shopping, we popped into another spot to grab a few beets and some recyclable paper eggs. And then our morning of creating, dipping and dyeing began! I tweaked and modified the processes on how to do this from what can be found online, because many of them seemed incredibly tedious just to add a splash of colour to a few eggs! Some folks were dipping their eggs overnight, others were juicing different veggies to get that perfect shade… But me? I like simplicity. 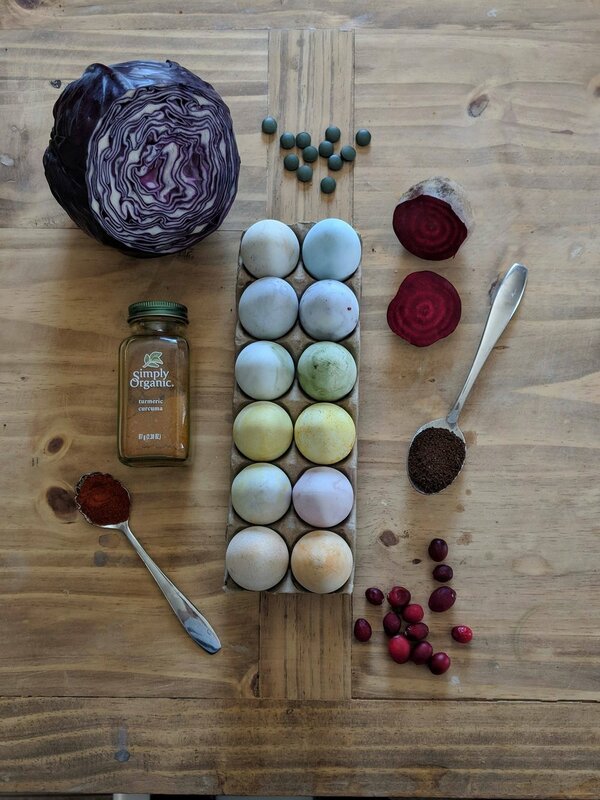 So if you’ve ever wanted to try your hand at natural egg dyes, read on! Not only was the process I came up with super simple, but it was 100% Spiderman approved. 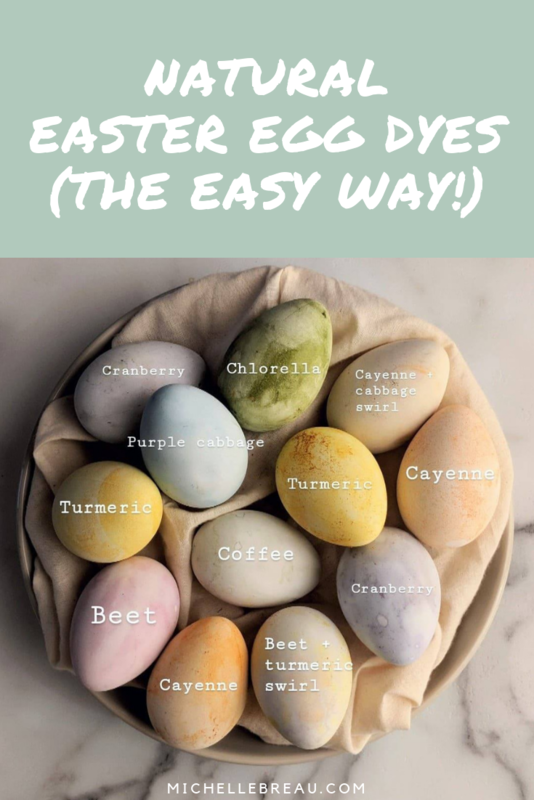 A dozen eggs (You can either use whole eggs and poke a small pin-hole in either end to blow out the egg itself, or use the 100% recyclable paper eggs that can be found at just about any craft store. Walmart even carries them! Veggies, berries and herbs of your choosing. We used beets, chlorella, cranberries, coffee, purple cabbage, turmeric and cayenne powder. If you don’t have chlorella caps, you can use any greens powder for this. I have heard that some folks have success using spinach or parsley, but this is the only one that didn’t work well for us. I have also spoken to friends who have had great success with boiled onion skins, blueberries and goji berries! Optional for the creative part: Paintbrushes, rubber bands masking tape, newspapers for keeping the table clean, etc. FOR THE COFFEE: Simply brew a cup of coffee, then set aside with a tablespoon or so of extra grind. FOR THE BEETS, PURPLE CABBAGE AND CRANBERRIES: Add to separate small pots and add 2 cups of water. bring to a boil, and add a capful or two of vinegar to help draw out the colours from each food. Note that you' want your dyes to have a good depth of colour, so you don’t want to dilute it with too much water! Allow your veggies to boil on medium heat for about 3-5 minutes, then remove from heat and set aside to cool. For the cranberries, I recommend mashing them to draw out more colour. Once cooled, reserve a cup of each colour, and keep one or two of each fruit & veggie to use to press additional colour on to your eggs. You can create some beautiful swirls using the veggies themselves here - Especially the slightly mashed cranberries! FOR THE CHLORELLA CAPS or greens powder: If you have a mortar & pestle, I recommend grinding them down to a fine powder. Next, add a tablespoon or two of water and grab a brush. This gives the most gorgeous, deep green! We attempted to do this dye the same way we did for the fruits and veggies, but the colour was too soft because the green was far too diluted by the water. This method worked much better! If you don’t have a mortar & pestle, toss your chlorella caps into a bag and crush them with the back of a spoon or a rolling pin. Then, add a few tablespoons of water to the bag and paint or dip your eggs to your heart’s content! FOR THE CAYENNE & TURMERIC: Similar to the chlorella, simply add 1/2 tablespoon or so of the spice to a small bowl or bag, then add several tablespoons of water and dip away! I tried the boil method with the spices as well as this method. I found a far more brilliant colour with keeping them less diluted! Once you have your dyes and eggs ready to go, have fun with it! You can try dipping them, you can use some of the boiled veggies to press different swirly shapes on your eggs, or you can even apply rubber bands, stickers or pieces of tape before you dip them to make different designs! For the coffee, we dipped the egg first and then used a pinch of the grind to gently press more colour into the eggs and to create a sort of speckle design. Coffee was probably the softest colour, and it would have likely been much deeper if we left the egg in the dye for a few hours - But again, I wanted this process to be as simple as possible! If it’s not easy, it’s not happening. For the chlorella, we used our fingers to paint and swirl different designs on the egg. This was by far the deepest colour, with turmeric and beet coming in at a close second! The purple cabbage also created the most brilliant purpley-blue. It was stunning! We used the little pieces of cabbage that were boiled to dab on additional drops of colour, which deepened them even more. If you want to keep this really simple, I’d recommend picking just 2 or 3 colours to play around with. The beauty of this is that you can keep it really simple, or you can go all out! You decide. Once they’ve had a chance to dry, place them in your favourite bowl and display wherever you’d like to add a pop of fresh colour! The “nest” underneath is a crinkled-up old produce bag, but you could use an old dish towel or just the bowl itself! Shabby chic is totally in, right? Well I hope you guys enjoyed this one, and that it adds a pop of fun and colour to your family’s Easter gatherings for years to come. Be sure to let me know in the comments which colours and designs you try, and how this process works out for you! Want even more ways to ditch the chemicals while still enjoying a whole, awesome life? Then check out my new program, DETOX30 - A 30-day, online & interactive program designed to help you safely detoxify your home, body and mind from the inside out. Or join me over on Instagram where I share lots of information, tips and recipes to help you live a happier, healthier life.